Roots and Blues: A Celebration by Arnold Adoff. Review: Culture isn't always the most interesting thing to read about, right? That's what I thought until I read Roots and Blues by Arnold Adoff. He really writes in an interesting way. This book is a collection of poems that relates what life was like for African Americans that worked on massive plantations. Since when did culture and social studies get so interesting? Roots and Blues is a series of poems that relates what life was like for African Americans during the time where they were forced to do manual labor on plantations. It mixes their feelings through their music created during this time period and historical evidence on what was going on around that time period. In the beginning, the African people live in their native land. They're then put on the chain gang and brought to America. In America, they live under extremely harsh conditions, as described through the poems. African Americans invent a new style of music to convey their feelings, called the blues. They communicated their feelings through their music and others actually understood their thoughts. Soon, fabulous musicians appeared, some of which are still popular today. The blues brought people together and unified the African Americans through a time of terror and hate. The author, Arnold Adoff, does a wonderful job of mysteriously conveying the feelings that the African Americans probably experienced during the time period discussed in the book. Through poems, he hints at what they felt and how they expressed their feelings through a new style of music called the blues. It leaves the reader trying to decode the words that are said. The author opens up paths of interpretation that the reader can follow. You can interpret it different ways, which makes the book fun to read. The author does a phenomenal job of writing this story. He shows heaps of enthusiasm through his writing. I like how the author communicates the feelings of the African American people through poems. By doing this, it helps the reader understand information in a fun and exciting way. Roots and Blues is an excellent book, and Adoff writes with exceptional experience and makes reading worthwhile. I rate this book five out of five possible stars. 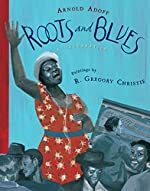 We would like to thank Houghton Mifflin Harcourt for providing a copy of Roots and Blues: A Celebration for this review. Have you read Roots and Blues: A Celebration? How would you rate it?